UPDATED: Fri., Nov. 2, 2018, 8:01 p.m.
Brandon Hertz kicked off his 11th birthday with a half-dozen double chocolate, apple fritter and pumpkin doughnuts. He and his grandmother, Jeanie Bryant, were visiting Amy’s Donuts, a doughnut shop that opened Thursday morning in Spokane Valley to much anticipation. Amy’s Donuts features more than 120 varieties of donuts – which cost around $2 each – with toppings such as Captain Crunch cereal, Twix candy bars and rainbow sprinkles. Bryant said the shop makes a nice addition to Spokane Valley’s growing selection of restaurants. “They have a good variety of donuts, one of the largest I’ve ever seen,” she said. If Bryant had to pick a doughnut that describes her personality, it would be one that’s “sweet with sprinkles and a little bit of old-fashioned underneath,” she said. Chin and Amy Kim launched Amy’s Donuts five years ago in Colorado Springs, Colorado, with a goal of building a small doughnut chain. 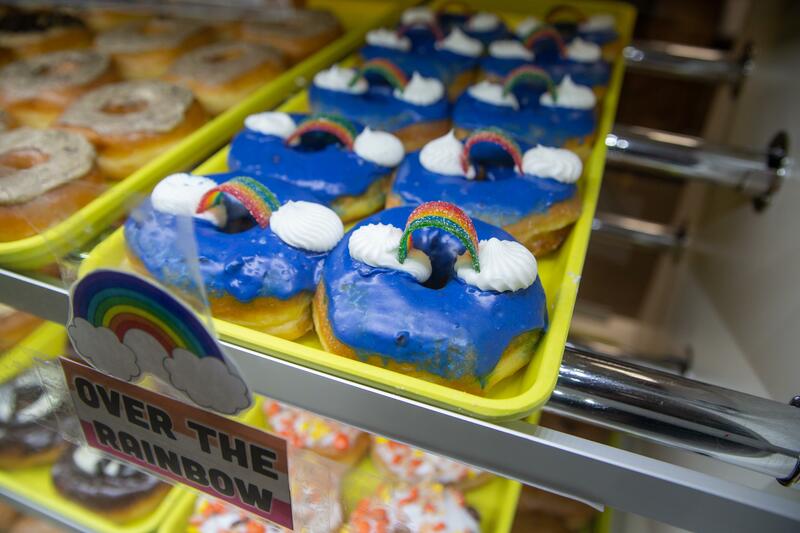 The business rapidly gained a following for its quirky and colorful donuts through word of mouth and social media. As a result, the couple opened other shops in Cleveland and Tucson, Arizona, which both had lines of people out the door on their opening days. In May, the couple announced they would be opening a location in Spokane Valley. They cited affordability, quality of life and the need for a family-friendly doughnut shop as reasons for a fourth location, this time in the Inland Northwest. Amy’s Donuts at 11519 E. Sprague Ave., includes seating for about 50 people. It is open 5 a.m. to midnight, and 24 hours Friday and Saturday. The drive-thru is expected to be open in two weeks. Store manager Katherine Bich said business was steady Thursday morning, although there wasn’t a line out of the door when they opened the shop. Eric Hinnenkane and his daughter, Addy, make it a point to visit a new coffee shop or restaurant to grab breakfast on Thursdays – which is when she has a late morning start for school. This week, it was Amy’s Donuts. They purchased a half dozen doughnuts that included Amy’s Almond Joy, Maple Turtle – topped with pecans and chocolate – and a strawberry-filled doughnut. Hinnenkane said Amy’s Donuts is a unique concept for the area. Published: Nov. 1, 2018, 5:28 p.m. Updated: Nov. 2, 2018, 8:01 p.m.